Autumn is a popular birding season because of migration, cooler temperatures and beautiful foliage that all add even more excitement to birding. But where should you visit to see the best fall birds? Fall birds still need food, water and shelter, and finding habitats and birding hotspots that offer those features in abundance throughout the season will guarantee a great birding experience. Migration Flyways: The predictable routes of bird migration are a great place to start when looking for fall birds. Many national wildlife refuges and nature preserves are found along migration corridors, and finding birds in large concentrations during migration periods can be easy. South Shores: The southern shores of large waterways such as lakes, bays and wide rivers (or northern shores for birders in the Southern Hemisphere) are a popular congregating spot for migrating birds to rest after crossing the water. The best of these areas will also have good mudflats or scrub woodlands near the shore for better foraging. Cliffs and Mountainsides: As the morning sun warms autumn air, thermal currents rise along the edges of cliffs and mountains, making soaring flight much easier for migrating raptors. Particularly near passes that coincide with migration flyways, these areas can offer amazing spectacles as tremendous kettles of raptors work their way south. Parks and Orchards: Late blooming flower gardens or fruit harvests attract autumn birds with a bounty of insects, nectar and other foods. This can concentrate migrating birds in these areas when other food sources are scarce, making the birding very rewarding for finding a wide range of colorful species. Agricultural Fields: After grain is harvested, spilled grain and the newly turned fields that have been prepped for winter are ideal places to find a wide variety of granivorous bird species. These areas will be especially productive where there are woodlands nearby for additional shelter. Pine Forests: Coniferous forests yield abundant seed crops that are popular for feeding birds in autumn, and many bird species will also cache the seeds for winter use. While many of the birds that prefer this area may stay in the same range year-round, they can be easier to see while they are more active foraging in fall. Coastal Shores: Many birds that breed far to the north will visit coastal shores in winter, and their arrival in fall can make birding along the beach spectacular. Take all necessary precautions to protect beach birds, however, and be prepared for colder weather and bitter winds along the shore. Scenic Drives: Many scenic drive routes are planned for the best autumn foliage, and picnic areas, scenic overlooks and trails along those drives can be beautiful for autumn birding. Opt for areas that feature a range of different forest types to be able to enjoy many different bird species along the way. Bird Festivals: Fall bird festivals scheduled in September, October and November are planned to take advantage of the peak of fall migration. These festivals may also celebrate the arrival of returning winter birds, especially where there are large flocks that gather outside the breeding season. Check for local festivals and plan to take field trips or attend seasonal lectures to learn more about birds. Bird-Friendly Backyards: If you take steps to attract autumn birds, you can find great seasonal birding right in your own backyard. Choose the best autumn foods for birds, winterize your bird houses for shelter and use your leaf litter to attract birds, and you may be surprised at how many unique birds stop by. Even in the best habitats and on the prettiest fall days, it can still be difficult to find birds. Keep the following tips in mind if you're having trouble finding autumn birds. Revisit the same birding hotspots frequently. As birds migrate, the local avian population can change daily, and every new day may bring different birds to see. Contact local birding organizations or check online reports for vagrants. These accidental birds are most common in autumn, and it is always possible that a very rare bird may show up far from where it is expected. Learn where the bird has been sighted, and you can make plans to see it. Watch birds carefully and take extra care with identification. Autumn birds may lack the bright colors and clear markings of their breeding plumage and can be more confusing, so the plain bird you think you know could actually be a more unusual and more exciting find. Autumn is a great season for birding if you know where to go to find the birds. Fortunately, there are many popular habitats to choose from, and with the abundance of vagrant birds in this season, there is always something more to see and another bird to add to your life list. 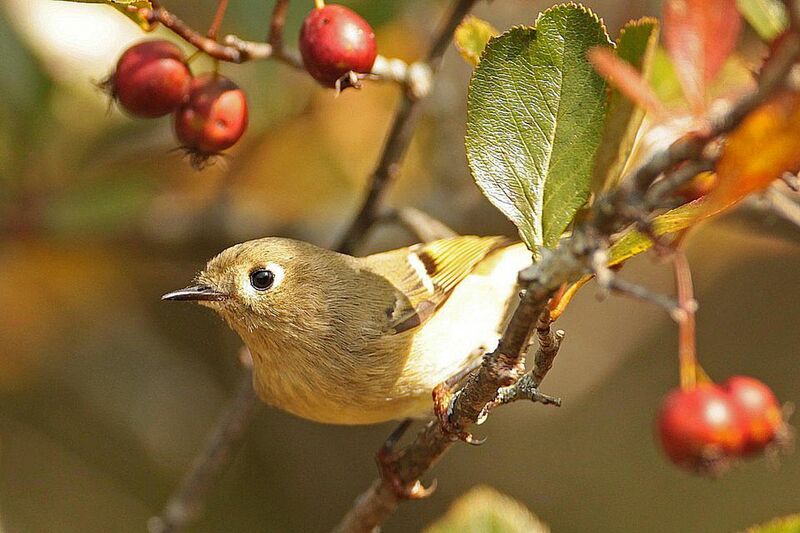 When Is Fall Bird Migration? See Puffins In These Great Places! What Do Wild Turkeys Eat? Should You Feed Wild Birds in the Fall? Get Rid of These Least Wanted Backyard Birds - Safely and Easily! Which Yellowlegs Is Which? Learn the difference!